One of the most exciting aspects of any vacation is getting to eat three square meals a day in a brand-new place. From Chicago to Paris to the outback of Australia, food is one of the best reflections of history, culture, people, and place. While it’s true that almost any trip will afford you new dishes to taste, for the visitor to Niagara, taste is an experience that is second to none. From the many excellent restaurants gracing the city of Niagara Falls to the farm-to-table establishments in the towns and wineries that make up the Niagara Peninsula, eating in Niagara need never be an afterthought. Nowhere is this truer than in the Rainbow Room, a fine dining Italian restaurant operated under the watchful and creative eye of celebrity chef, Massimo Capra. Born in Italy, Capra routinely offers specialty culinary events at the Rainbow Room centered on the regions or towns of his homeland, and on Friday, March 4th, he’s highlighting Abruzzo. Abruzzo is a region in Italy that covers just over 4,000 square miles and is home to some 1.3 million people. Known as a land of poets and artists, the people hold fast to many forms of traditional artisanship including their pasta making. Considered the greenest area in all of Europe, roughly one third of the area has been set aside as protected nature preserves and national parks. Abruzzo’s parks and reserves are, in many ways, responsible for assisting in the survival of up to 75 percent of the wildlife in Europe, including many rare species such as the Golden Eagle, the Apennine Wolf, and the Small Wading Dotterel. It is a diverse and fertile place, and, of course, it’s known for its cuisine. 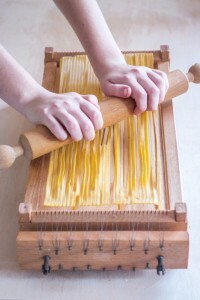 Maccheroni alla Chitarra, a pasta that is similar in shape to spaghetti that is formed when pressed through a chitarra. Gnocchi carrati, a dish that includes bacon, pecorino, and eggs. Pastuccia, a polenta stew that features eggs, cheese, and sausage. Pecora al cotturo, which is lamb that has been stuffed with a wide variety of mountain herbs before being cooked in a copper pot. The cuisine of Abruzzo will be on full display during the night of the March 4th culinary event, and each course will be paired with wine from the region as well. Masciarelli Winery is a fantastic winery that started with a vineyard that covered just 2.5 hectares. Today, it boasts over 300 hectares scattered across the Abruzzo region, which allows for wines that aren’t just distinct to Abruzzo but distinct to the many different terroirs within the region. Abruzzo, then, is honored in every bite and sip taken throughout this once-in-a-lifetime experience. For a taste of Abruzzo while you’re in the heart of Niagara, reserve your seat at the Rainbow Room by Massimo Capra now.